The Dogs of the Dow theory suggests investors select the ten stocks that have the highest dividend yield from the stocks in the Dow Jones Industrial Index (DJIA) after the close of business on the last trading day of the year. Once the ten stocks are determined, an investor invests an equal dollar amount in each of the ten stocks and holds them for the entire next year. 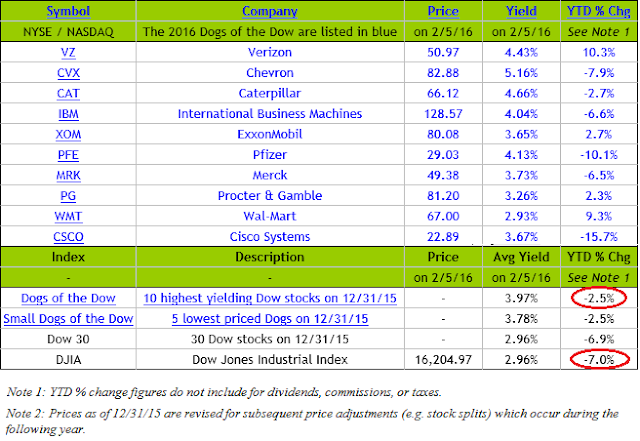 Below is the 2016 Dogs of the Dow. As the below table shows, year to date through Friday's close, the Dow dogs have outperformed the Dow Jones Industrial Index, -2.5% versus -7.0% . As the below table also shows, the average yield for the 2016 Dogs of the Dow of 3.97% remains higher than the overall DJIA yield of 2.96%. In this market environment where the market is struggling to gain any traction, the income yield on the stocks seems to have enticed investors to purchase, or at least hold these higher yielding stocks. One aspect of market returns in 2015 was the narrow nature of stock participation. As we noted in our Winter 2016 Investor Letter, the FANG stocks were up over 60% last year on a cap weighted basis. So far in 2016, the average return of the FANG stocks is -12%. The outperformance of the Dow Dogs at the start of 2016 may be a larger indicator of investor interest in more value oriented equities. 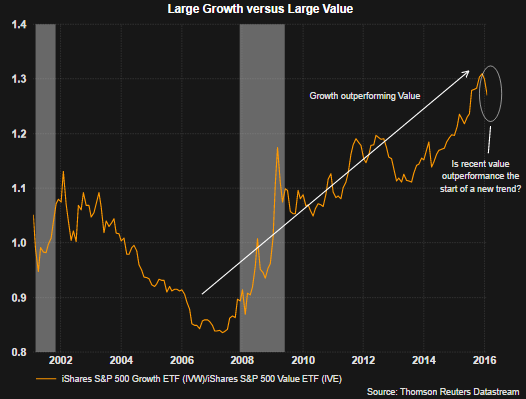 As the below chart details, growth style equities have been on a strong outperformance trend versus value since the end of the financial crisis. The brief return to value outperformance has occurred during short stints since 2009, but has been unable to gain traction on a longer term basis. Maybe this early trend in 2016 will be the theme for the remainder of the year. We discussed the growth value difference in our post at the end of last year, 2015 Was A Year For Growth Stocks And Only A Handful Were Needed.